On Wednesday the 5th November 2008 at the Regular Meeting of Lodge St. John Slammanan No 484, the Right Worshipful Provincial Grand Master Brother John McKenzie caught Brother Alexander Montgomery (Monty) by surprise when he announced and subsequently presented him with the Honorary Grand Rank of Bard, which had been awarded by Grand Lodge to Monty in recognition of his services not only to his own Lodge but to Freemasonry in general. The Right Worshipful Provincial Grand Master indicated that it gave him great personal pleasure to present Brother Monty with the Grand Lodge Rank of Honorary Grand Bard an honour which was well deserved. Brother Alex has been the Right Worshipful Master of Lodge Slammanan No 484, 6 times in total, once in 1977 and 5 consecutive years from 2000 - 05. 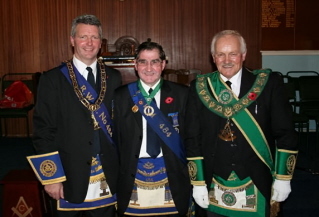 He has also served as Lodge Secretary, officially and unofficially, since 1988. He has been a Provincial Grand Lodge Office Bearer since 1994 and attained the office of Senior Provincial Grand Warden in 2005. In response Brother Montgomery thanked the Right Worshipful Provincial Grand Master, Past Master's, Office-Bearers and Brethren of Lodge St. John Slamannan No 484 for the support they had given him and hoped that the Lodge would go from strength to strength.